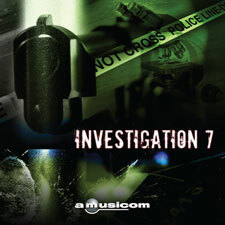 Evocative, inquistive electronica, rock orchestra and soundscapes for compelling pursuits and intriguing investigations. 7 01:01 Fact Find Puzzling and Dramatic. Circling piano with guitar, pulsing loops and perc. 37 00:31 FULL30 Puzzling and Dramatic. Circling piano with guitar, pulsing loops and perc. 67 00:16 FULL15 Puzzling and Dramatic. Circling piano with guitar, pulsing loops and perc.